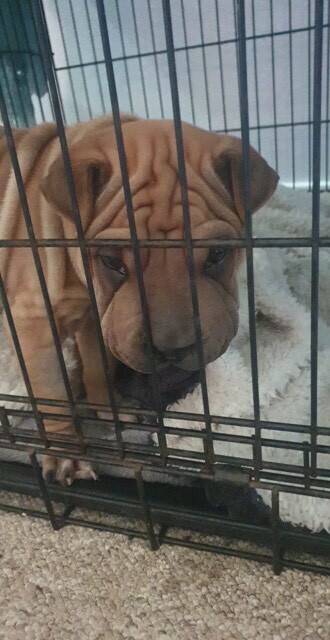 We are a dedicated group of volunteers who rescue, rehabilitate and rehome Shar Pei and Shar Pei Cross dogs. WE work tirelessy to create a better life for those who have been surrendered or have ended up on deathrow all over Australia. THANKFULLY for the close observations of his amazing foster carer Brooke and quick acting of our team and the caring veterinarians, none of Rollo’s digestional tract died or need to be removed, if it was left undetected any longer Rollo would not be with us now. During surgery to correct the torsions it was also discovered that Rollo had an unknown (never ever seen by the vets before!!!) parasite within his digestional tract which could have triggered the gas/inflamation/infection therefor having the domino effect to the condition he ended up in. As this parasite has not been seen before or familiar to the treating veterinarians and colleagues, the best course of action is to aggressively treat to eradicate it, as a precaution his sibling will also be treated. The vet bills are in the thousands as we speak and expected to climb even higher. We had to do something and fast, and as it stands today it looks like Rollo is on the path to leading a better life. It’s just what we do, step in, in these types of cases. However, we now need you to help us out, to chip in. We need to raise $3,000 which hopefully will cover at least the initial costs associated with Rollo’s surgery and recovery. As you sit back on the couch tonight, think of Rollo and our team working around the clock. Just $5 from 600 of you would get us over the line. Hope Rollo gets better soon. Good luck little Angel!